Size of tree: 1-15 feet high, spreading to bushy. Bloom and season: white to pink bell shape flowers in February-March, Red Berries in summer. Pruning needs: remove dead wood only. Water needs: drought tolerant once established. Wikipedia claims there are 106 species of Manzanitas. The many varieties range from low growing groundcovers to the whiteleaf Manzanita, Arctostaphylos viscida, topping out at nearly 15 feet. Manzanitas grow naturally in dry to semi dry Mediterranean climates, ranging from Mexico, through California, Arizona, Nevada, Oregon, and Washington. They thrive in well drained soils, from sandy to gravel/loam. 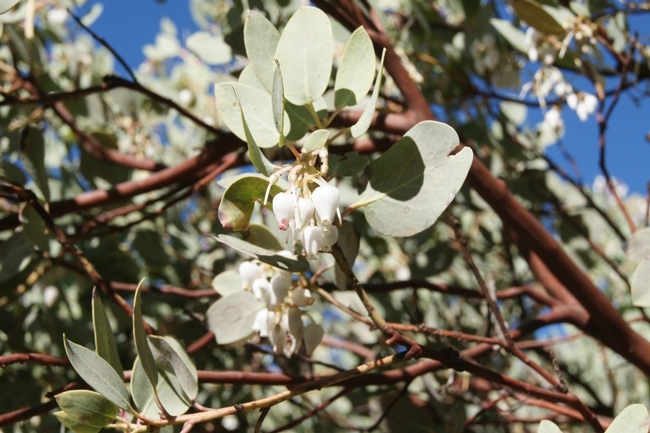 Manzanita species have many attractive qualities for the home garden. They bloom very early; here on the central coast beginning mid-February. Their bell shaped white or pink blooms are a welcome respite for pollinators, which have a hard time finding nectar that time of year. Ever tasted manzanita nectar? It is a must! Gently squeeze the bell shaped flower (watch for bees though) and you will be rewarded with a small drop of nectar. After the bloom, the dropped flowers resemble a blanket of snow flakes on the ground. Next, expect berries to form and turn red. The berries are an important food source for vertebrates, from birds to bears. Native Americans gathered these berries for food. What's in the name? The berries resemble small red apples and the Spanish word for little apple is manzana. Two additional attractive features include their silver dollar-sized, greyish-green leaves and the smooth mahogany bark, which sheds itself yearly as the bark grows and expands, just like a reptile sheds its skin. The trunk and branches often grow into twisted yet graceful forms. Make room for a front and center spot in your garden for this fantastic California native species.